Ildar Abdrazakov & Marlis Petersen in "Marriage of Figaro"
After a shaky summer of union contract negotiations that threatened to close down the entire season, with the issues finally resolved, the Metropolitan Opera began its scheduled operas last month with its production of Mozart’s wondrous “Marriage of Figaro”. It was also the first Live-in-HD broadcast in a movie theater near you. It was well received at the opening as well as this simulcast performance. Set in an 18th century Seville manor house during the 1930’s, the stars were all aligned in the operatic heavens as the conducting and orchestral playing, the singing and acting by the principals and the chorus, and the physical production, all combined to create a truly effervescent experience. It would be hard to judge who was having the greater time, the worldly performers or their worldwide audience. On hand as the articulate broadcast host was the always charming Renée Fleming. The production was the work of British Director Sir Richard Eyre. The Metropolian Orchestra was led by Music Director James Levine after his lengthy period coping with health issues. (The opening night was his first in four years). Yet, as is often the case, once again the star of the proceedings (aided and abetted by his librettist Lorenzo Da Ponte) was unquestionably Mozart. As Levine conducted the orchestra in Mozart’s sublimely gorgeous music, a pantomime on stage introduced the principal characters of the opera with the clever use of a revolving stage. This lively and energetic cast included the accomplished bass-baritone Ildar Abdrazakov (seen in the title role of the Met’s “Prince Igor” last season) as the valet Figaro and the beautifully-voiced soprano Marlis Petersen as his bride Susanna (a much earthier rendition than is typical); both were comic superstars in this work. Also featured were Peter Mattei in gorgeous voice as their philandering Count Almaviva and equally impressive soprano Amanda Majeski as his long-suffering Countess. 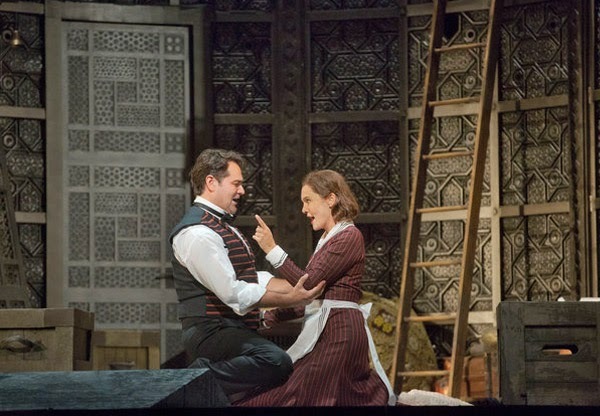 Also in the cast were mezzo-soprano Isabel Leonard, wonderful as the hormonally frisky pageboy Cherubino, bass-baritone John Del Carlo as the ever pompous Doctor Bartolo, and mezzo-soprano Susanne Mentzer as his former housekeeper Marcellina. (The relationship of Bartolo and Marcellina to Figaro provides the sort of twist that Gilbert and Sullivan would later satirize). The rest of the cast included Greg Fedderly as Don Basilio, Philip Cokorinos as Antonio, a radiant Ying Fang as Barbarina and Scott Scully as Don Curzio. The all-important expert HD Direction was by Gary Halvorson, with a revolving Set Design and lovely Costume Design, both by Rob Howell; the costumes were universally praised, and justifiably so, but the sets were criticized for overpowering the proceedings at the Met, though this wasn’t often the case in the HD broadcast at all. The too-dim Lighting Design was by Paule Constable and the minimal Choreography by Sara Erde. The plot defies concise synopsis, so suffice it to say that there are some romantic complications for no fewer than four couples, all resolved happily by the final curtain. It is Mozart at his wickedly funniest and musically most complex. In the end, after not a few disguises and impersonations, all ends relatively well and reasonably sane. And that’s exactly what we hope for in a marriage, isn't it?